Sometimes sequels can be just as good as the originals. Our second pass through Ecuador yields more incredible time with our Ecuafamilia. 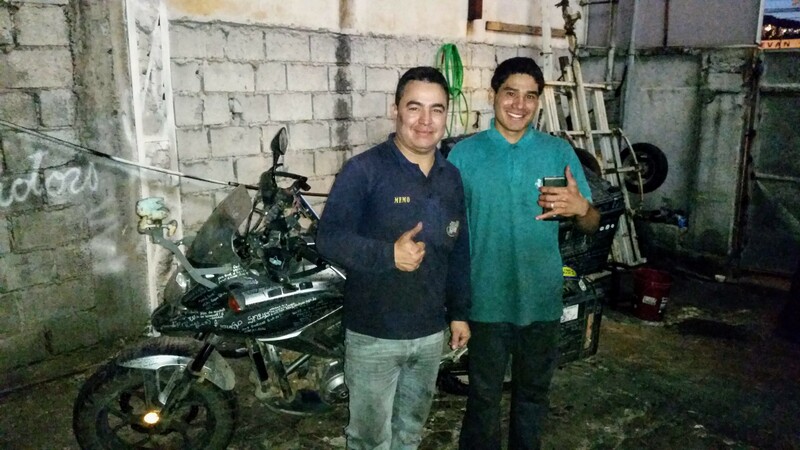 We also meet a great mechanic and make a decision about our shipping method back home. 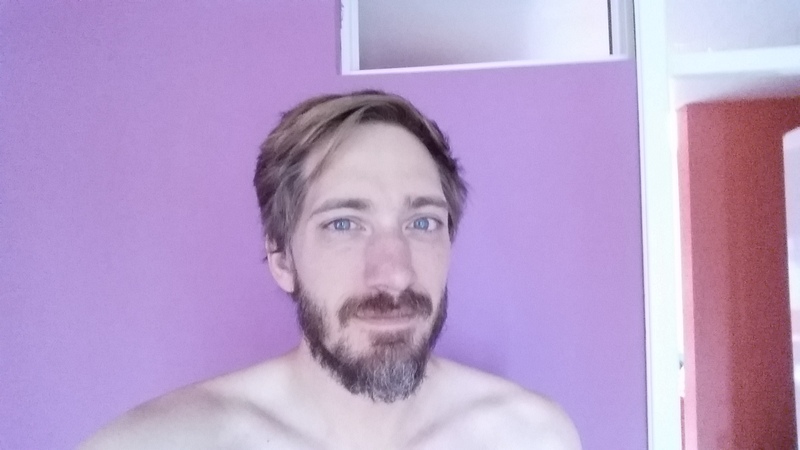 Realtime update: I figured I would lead with this since it’s been so long since my last post. My time home has been a real whirlwind, a real mixture of experiences. I’ve had some wonderful time with family and friends, but have also been quite preoccupied. My Dad went into the hospital about a week and a half ago and spent eleven days there. Updating my blog and planning my last loop have felt like afterthoughts recently. I think I will be back on the road in the next week or so, but I still have lots to do before then. Every day that I wait will mean more frigid conditions in the mountains, but I don’t want to leave before I am ready. I hope the coming days will be productive ones, but getting to my work has been a real challenge recently. 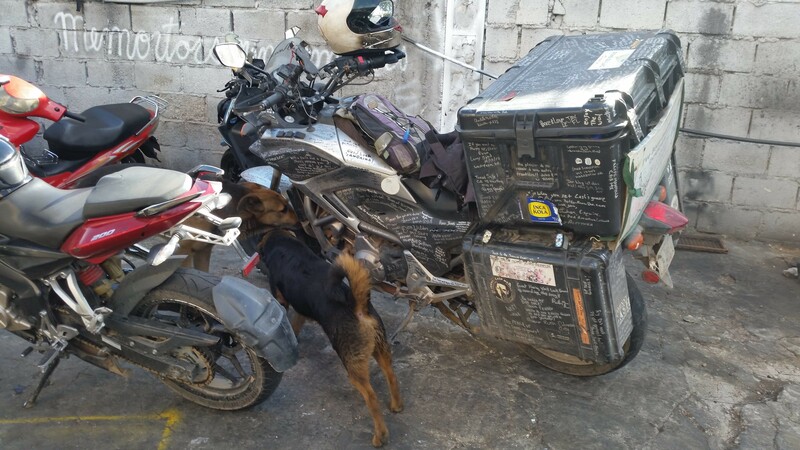 I had a nice ride up to Quito. In pretty much every Latin American county the closer you get to the capital city, the nicer the roads get. Quito sits up at 9,300 ft (2,800 m) elevation so I had a nice climb up familiar roads into the city. 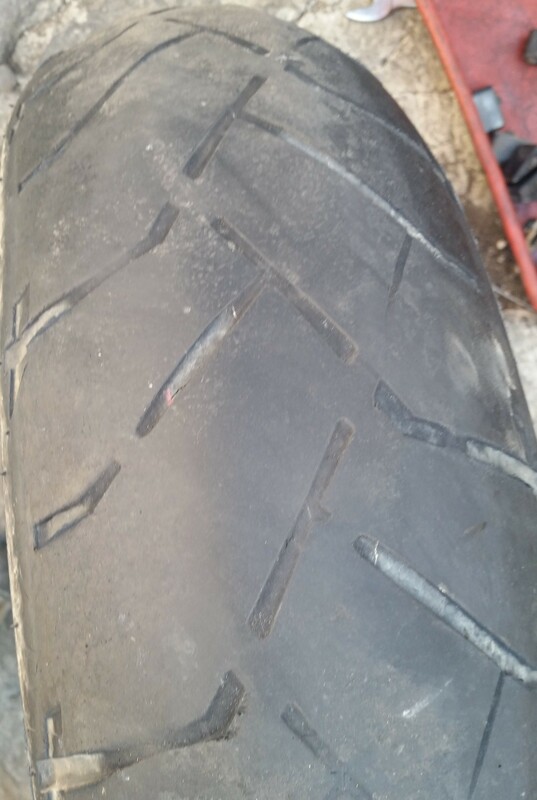 I was going to be stopping in the city to look for some mechanical things, most notably a rear tire. I had been trying to find an appropriate replacement since I was in Cusco. By this point, I was getting close to a dangerous level of tread. 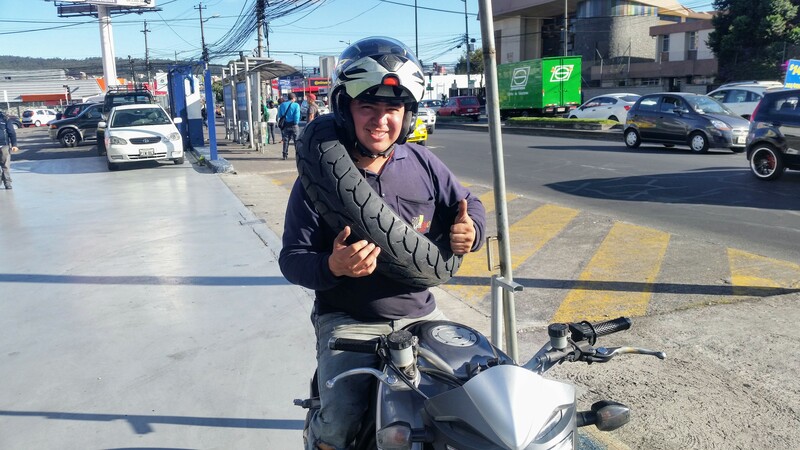 The last time I was in Quito I had seen an NC700X being used as a police bike, so I was confident in finding a good tire here. 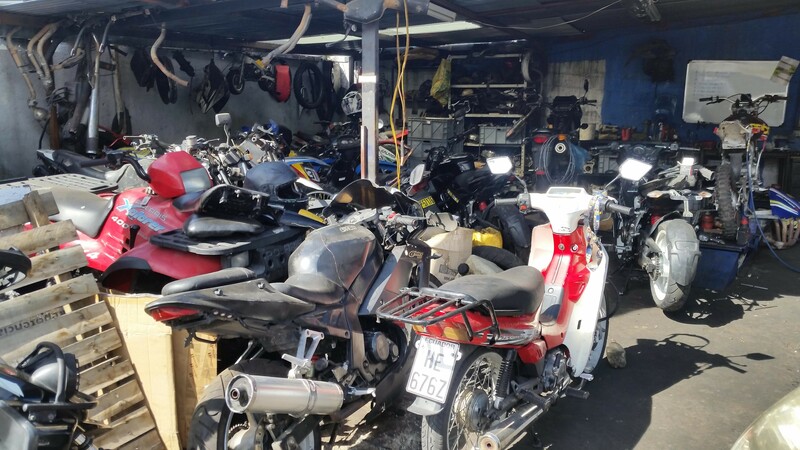 To find a mechanic, I used the app iOverlander. This app is basically a directory updated by other travelers. 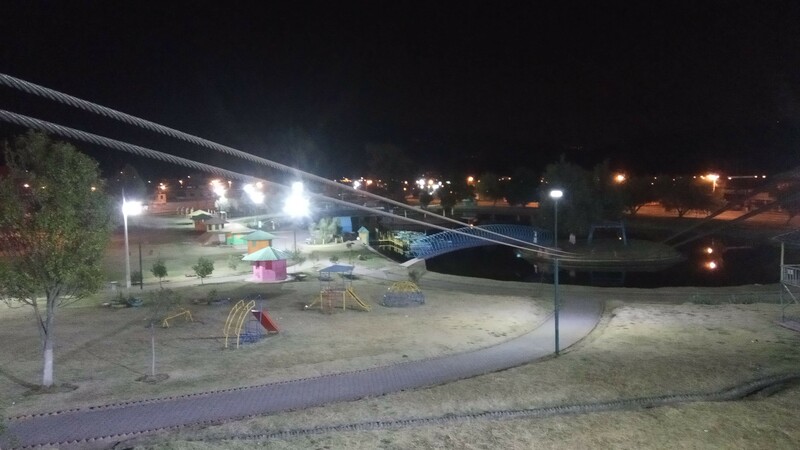 I have used it many times to find hostels, restaurants and even tourist attractions. It has really been a godsend on my trip. After reading good reviews, I navigated to Memo Motos. I could tell pretty quickly that I was in a good spot. He didn’t stock any tires, but there was a dealer just a few blocks away. 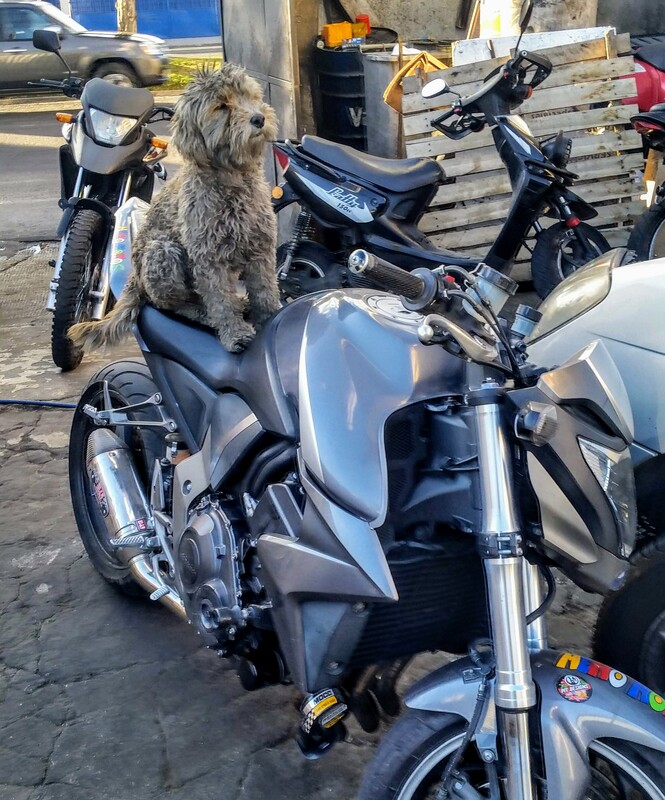 Annie was already without her rear wheel, so he invited me to hop on the back of his CBR1100. He took it pretty easy on the throttle, but it was still an exciting experience. I couldn’t remember the last time I had been on the passenger seat of a motorcycle. My foot still instinctively reached for the ground each time we came to a stop. The shop didn’t have an exact match, but I went with a slightly oversized street tire. I knew that the majority of this tire’s life will be spent on the smooth surfaces of North America. He got the dealer price for me: $134. Now the only question was: How do we get it back to the shop? I suppose his fur was initially white, but it easy to see that he’d received thousands of pets from greasy-handed mechanics. I had a great time chatting with Memo. 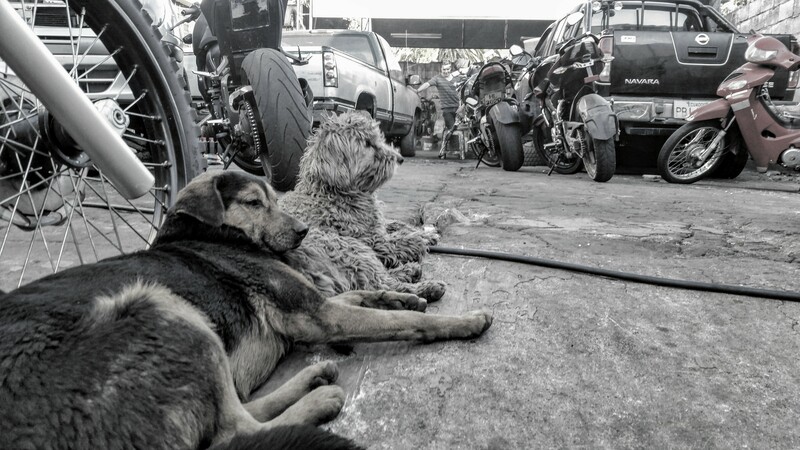 He’s raced motorcycles of various sizes in various countries. He’s originally from just over the border in Colombia. After my tire was changed, he did a little bit of work on my rear brake. 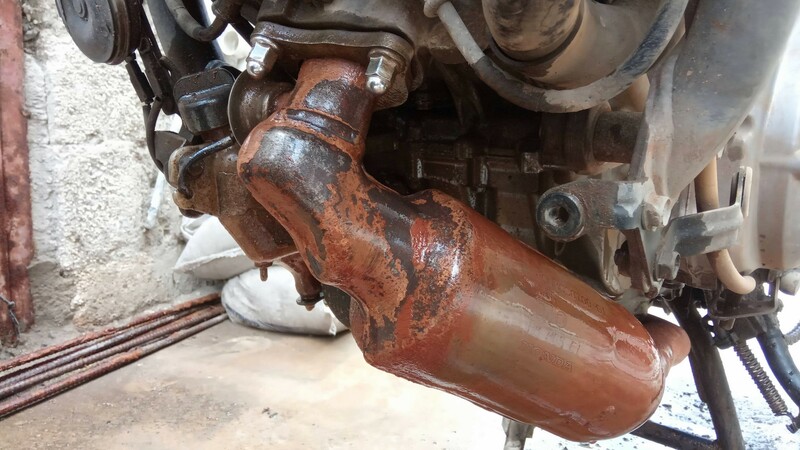 Finally, I also had an oil change done. He inspected my rear sprocket and gave it his blessing to get me back home. He was really serious about doing his work well, even re-doing the process of adjusting my chain tension multiple times. We exchanged info and did the signings. Though we hit the jackpot with our choice of mechanic, all of our daylight was exhausted. 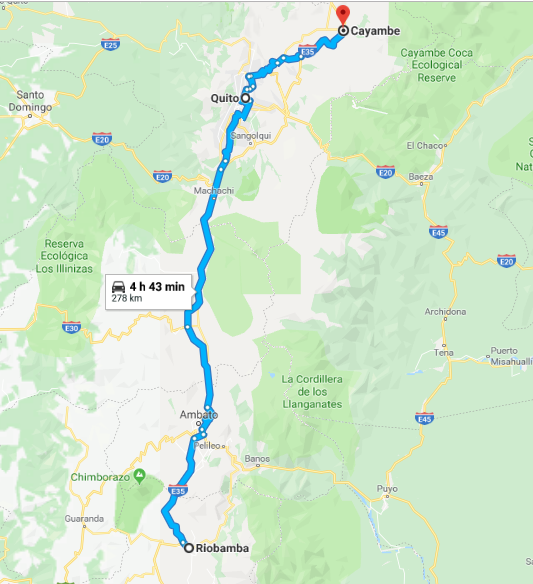 Still, I wanted to make it to Cayambe, the home of my Ecuafamilia, for the evening. Though the road was winding, I knew it well and many sections were lit. 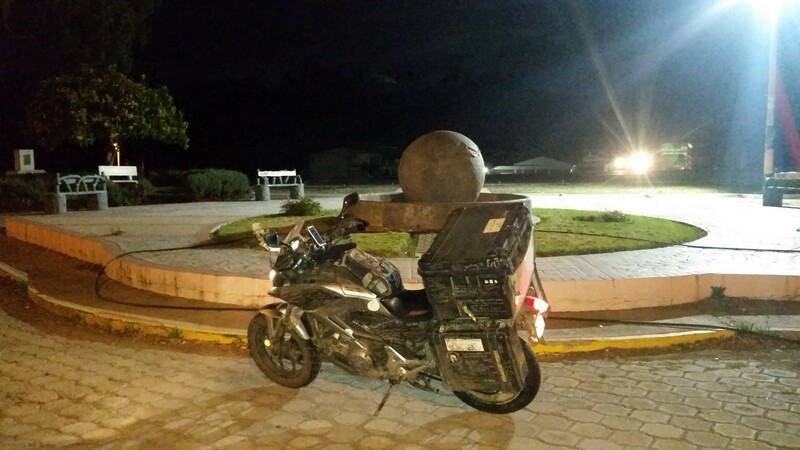 I made a real quick stop at the equator to snap a picture. It felt nice to be in my home-half of the globe. 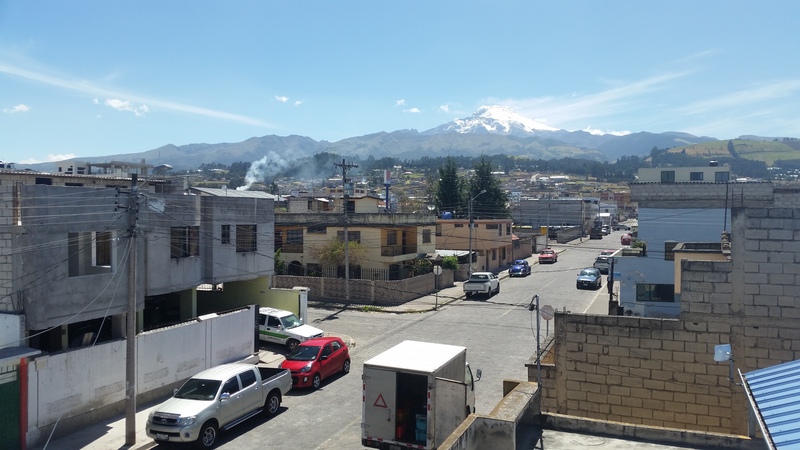 Riding into Cayambe seemed like a homecoming of sorts. The business and streets were all familiar and I knew where I was going. It was such a pleasure to walk into my home away from home. I’m going to step out of the day-to-day narrative for my time in Cayambe. It was a pause in the adventure, during which I spent most of my days writing, planning and eating an exorbitant amount of food. I sometimes feel bad about being brief about these sections of my trip. It almost feels like I’m not giving the important “characters” enough “screen time.” Especially in the case of my Ecuafamilia, I cannot overstate how important their presence is in my story. I’m not going to re-tell the story of how I became connected with this family, but it is back in THIS POST. 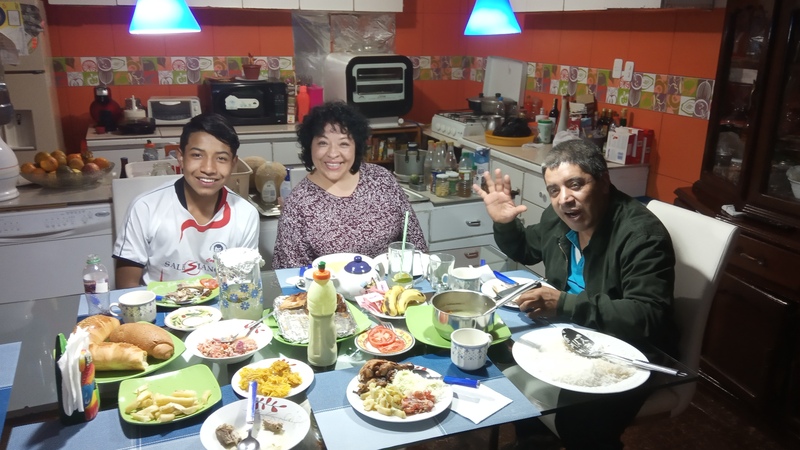 Up in the picture above are my hosts from the first go-round: Rosita, Polito and their son, Paoul. 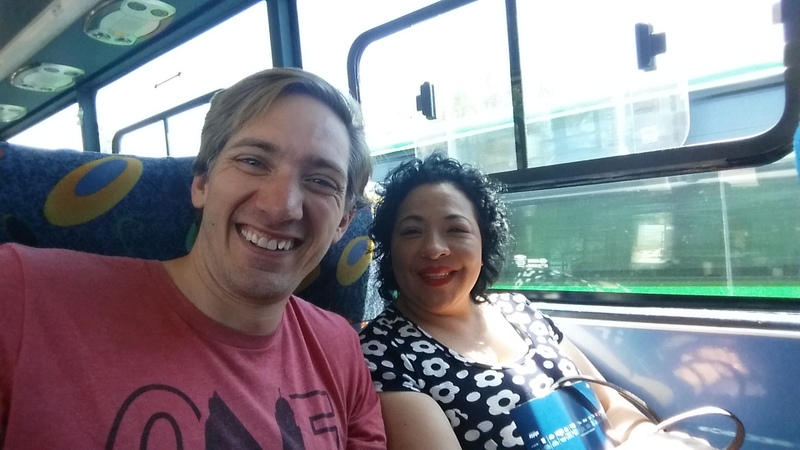 During this trip I would also get to meet their daughter Pame, whose trip to study in Vancouver ended up connecting our families. I would also get to spend some more time with Rosita’s sister, Gaby, who helped me so much the first time I was there. I said often that their home was “the land of seven options.” Whether it was the number of different foods on the table, the number of blankets on my bed, or the number of brushes that they gave me to clean Annie; I always had more than I needed. 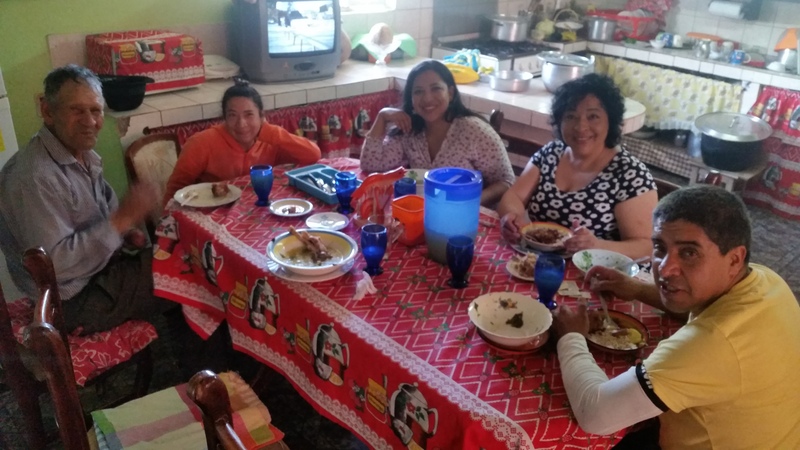 One of the most special experiences was getting to go visit the home of Rosita and Gaby’s parents. They live about an hour bus ride away from Cayambe. 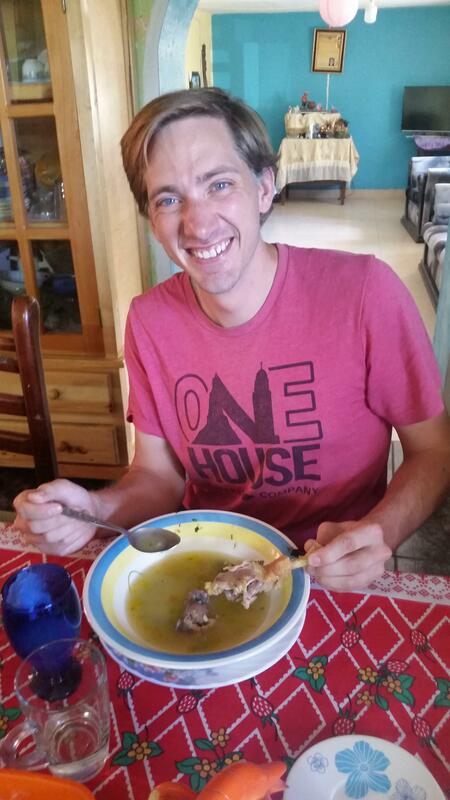 The ladies cooked me a feast of Caldo de Gallina. Translating that as “chicken soup” doesn’t really do it justice. It’s a work of art! They actually had a live chicken and it was a bit strange to watch Rosita and Gaby, dressed in pretty clothes, converting a live chicken into lunch. They really didn’t waste a single part of it. Even the head, with beak removed, goes into the pot. This day was a really special one for me. As with my first visit, I felt like such an honored guest. 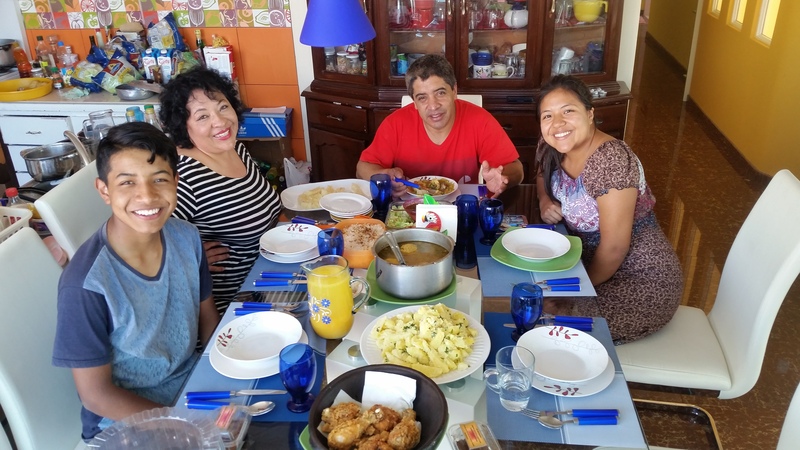 During the weekend, Pame, who is studying in Quito, came to stay at her parent’s place. Not only was she a great person to be around, it now meant that we had a real translator in the group. I really enjoyed hearing the story of how she met my Sister and Brother-in-law from her perspective. Gaby was a ton of help to me once again. She has worked in a lot of different fields and had a contact named Angel who works in shipping. 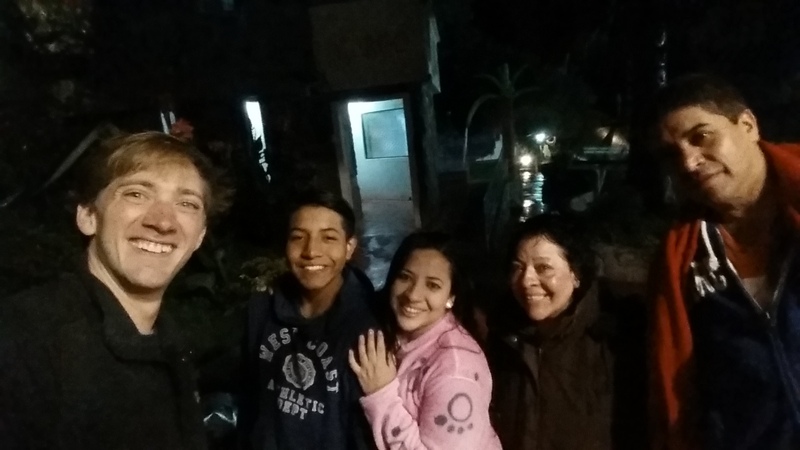 I visited him in his home and talked about the possibilities of shipping Annie home from Quito. He was a lot of help and was able to give me a solid estimate (about $1,700) with my dimensions. I was also in touch with a shipping agent in Bogota, Colombia and I tried to keep both options open for as long as I could. I was really torn about what to do. Getting Annie cleaned up took quite a bit of time. I’ve mentioned before just how sticky that red dust from Northern Argentina/Southern Brazil is. Despite being months in the past, I still had coats of it on my muffler. When the day finally came for the shipping decision, I was still torn. I decided to use the option in Quito. The flight would be going to New York City in about one week. The prices were similar and this would give me more time to experience more of Ecuador. Gaby and Rosita were excited and began to talk about all of the things we could do over the next week. Just as I was ordering the ticket for my flight to New York, my agent in Quito sent me an apologetic message that the plane I was scheduled for had now been overfilled with flowers (one of Ecuador’s main exports). This put me in a bit of a pinch, as I was too late to begin heading for Bogota that night. I would have preferred to take 5-6 days to reach there, now I would have just 3. 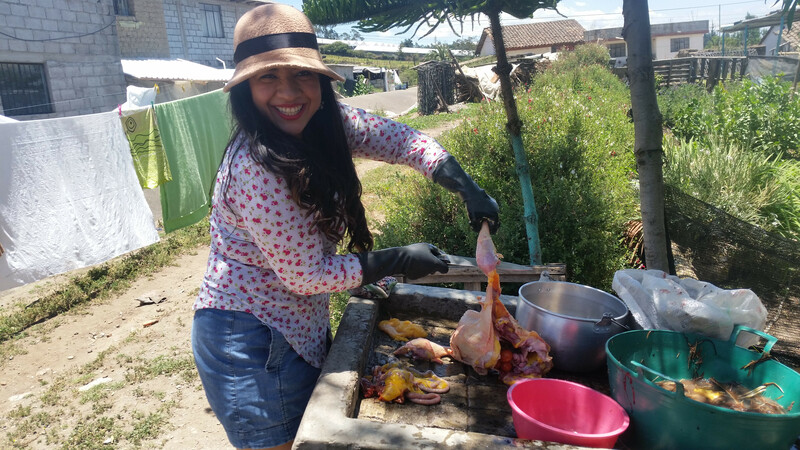 I was disappointed that I would not get more time with my Ecuafamilia, but they sent me out with a bang. 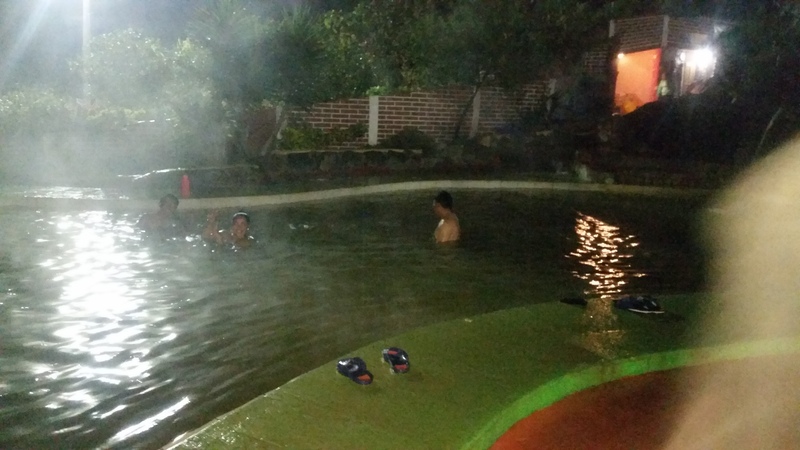 They took me to a natural hot springs resort which was about three hours to the north. We had a wonderful time there and stayed late into the evening even though it was a Wendnesday night. The next morning, it was time for me to go. Parting was even more difficult than the previous time, as I have no idea when I will next make it down here. These people are such a special part of my journey and I know I have made a lifetime connection with them. I feel so blessed to be a member of their family. It’s good to see another update, prayers for your father and safe travels as you head out this time of year. Thanks, George! We’ll take all the prayers we can get! You and your family will be always welcome in our house and I’m totally agree that we have a lifetime conection now!! I can’t wait to the next time we meet here or there with all our family members. We thank God for your life and the blessing that was to have you here. We love you! Te queremos muchoooo! Thank you so much. I still can’t even explain what your family means to me. This new connection has been one of the highlights of my journey. Un abrazo de bufalo! Wow what a family! Thanks for your struggle to get this out of your memory bank! So great to have you under our roof again for a while! Looking forward to your last leg in our great country! Have so admired your many ways to keep yourself safe and us informed! Brett it’s cold out there! I have a Gerbings heated jacket liner and gloves you may borrow.Just let me know. You have got to keep your core and hands warm. It’s imperative. Your dad is in my thoughts every day. Thanks, Doug! I have a heated vest and heated hand-grips. This set up has served me well, even into freezing temperatures. I am more concerned about sleeping, so I just bought a new sleeping bag that is for colder temperatures. Thank you so much for the offer. You’re a great friend. Great to hear from you, Gordon. Thank you for the prayers. It has been a difficult time for me recently, but I know God is good. Say hi to all of my Sampa amigos for me!